Lizzie Bramlett recently did a post about pyjamas, citing 1912 as the earliest reference she has found to date for their sale in catalogues. This predates the c. 1917 date when they begin to show up more often in catalogues and magazines as sensible sleeping attire, especially for women in England in case of zeppelin raids. 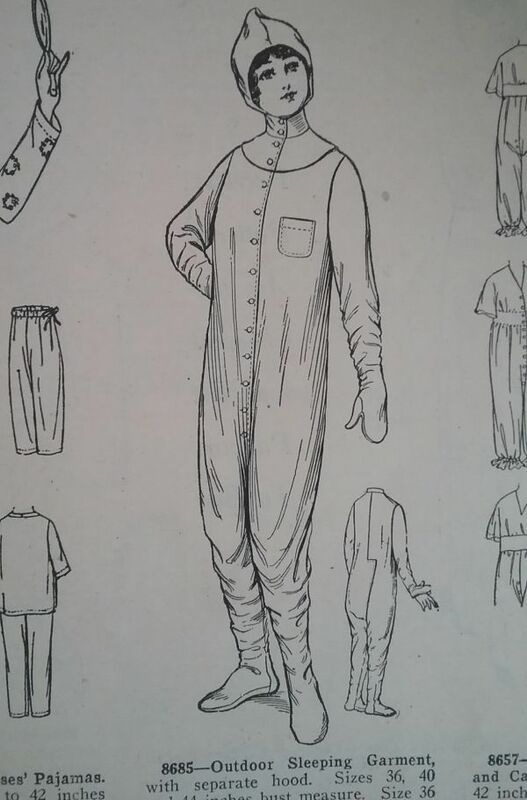 Bramlett also posted a 1919 pattern illustration for a sleeping pyjama intended for camping that looks a lot like a onesie. This might be the first of its kind! This entry was posted in Fadshions, Fashion and tagged lingerie, pyjamas. Bookmark the permalink. 2 Responses to Fadshions – The first Onesie? Now I’ve got to find out the first usage of “onesie”!